Whether they’ll admit it or not, most beer geeks have a soft spot for Guinness Stout. Relentless corporate greed and growth may have turned it into a shadow of the beer it used to be, but in the right bar at the right time, there’s still a bit of romance and fun in savouring a properly poured pint or three of the black stuff. But romance and fun can only take you so far when there are so many better stouts out there. 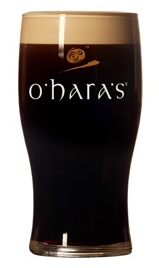 And one of them is O’hara’s Celtic Stout, brewed at the decade-old Carlow Brewing Company in Carlow, Ireland. I enjoyed O’Hara’s a fair bit when it was briefly available here in bottles a couple of years ago. And then I found it on tap tonight at my local watering hole, The Rhino, and had a couple of pints which I found to be better than pretty much any pint of Guinness I can recall tipping back. It’s nearly black, natch, with an inviting roasty aroma, and flavours of cocoa, fresh roasted coffee and slightly burnt malt, with a dry finish and a faint & not unpleasant sourness as an end note. Thanks to Diageo’s deep pockets, I doubt it’ll be displacing many Guinness taps any time soon – in fact, Rhino was still pouring Guinness right alongside it. But God bless Carlow Brewing for at least taking a shot. This entry was posted in beer reviews and tagged stout. Bookmark the permalink.